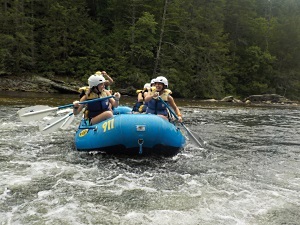 More than a summer camp, the SCDNR's Camp Wildwood is training leaders and offering the adventure of a lifetime. This past spring brought forth unusually beautiful pink flowers and later green leaves from an Eastern redbud along our John's Island dirt driveway. My daughter English Calhoun, a creative writing major at Charleston County School of the Arts, won this tree for composing a reflection about her experiences at Camp Wildwood just a short summer ago. Like so many before her - all filled with uncertainty on that first day at Kings Mountain - my daughter grew to love this camp that she was benevolently compelled to attend. Camp coordinator Dan DuPre relays the birth of Camp Wildwood, formerly known as Conservation Camp. "Camp started in 1954. The Garden Club of South Carolina had an epiphany that the youth of our state were not involved enough in the outdoors. 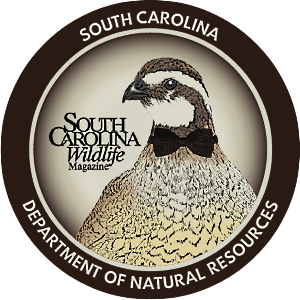 The Garden Club of South Carolina partnered with the Wildlife Department (now the S.C. Department of Natural Resources, SCDNR), local garden clubs and the South Carolina Wildlife Federation." The endeavor is made possible through cooperation. The S.C. Department of Parks, Recreation and Tourism offers the Kings Mountain State Park facility at cost while the SCDNR provides the staff. The Garden Club of South Carolina and garden clubs across the state contribute the modest $200 camp fee. 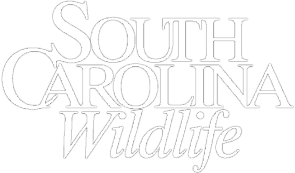 The Harry Hampton Wildlife Fund is the largest non-garden club sponsor, and the South Carolina Wildlife Federation is an emeritus sponsor. Each summer, usually the third week of June, one hundred campers descend on Kings Mountain State Park where they are greeted by forty staff members: counselors, professional staffers, a nurse and Miss Betty Wallace, who has prepared countless meals for calorie-burning Sandlappers. Eligible campers must have completed their freshman year of high school before the start of camp, and each applicant requires a recommendation from a sponsor. The rural setting and rustic atmosphere of the state park complement Camp Wildwood's focus on natural resources stewardship. The camp was built during the Depression by the Civilian Conservation Corps (CCC). DuPre recently celebrated his thirtieth year at camp, but his spiritual connection to this place was established years earlier. "My grandfather, Herman L. Dantzler, was in the CCC. When he dropped me off at camp, he walked me to my cabin, looked around and said, 'I built this cabin and carved my initials on that rafter.'" The camp consists of a dining hall, recreation hall, cabins and bath houses sprinkled through the woods at the lake's edge. As time seasons these structures and young people become increasingly reliant on technology, the camp buildings, which offer limited electricity and screens in the windows, seem increasingly primitive. Campers are not permitted to bring anything that requires electricity - no hair dryers or cell phones. Counselor and Clemson University agriculture major Thomas Chapman of Hartsville notes, "Young people are so sucked into technology, but when they get outdoors, they can take it all in: the sounds, the view and the weather. Camp Wildwood is the best week of every year." "From a fisheries standpoint, Kings Mountain State Park is a perfect place for camp," explains former fisheries instructor Miller White. "Throughout the course of the week, I would show kids dozens of species of live animals. A warm water stream from the lake gives an assemblage of species. The natural flowing spring-fed streams have much cooler water and a nice mix of habitats and deep pool areas. You can find a variety of live critters." Camp counselor and Clemson student Sally Seawright of Anderson recalls, "When I saw my cabin, I begged my parents not to leave me. By the second day, nobody wanted to go home." Over the years, BeBe Dalton Harrison has served Camp Wildwood in many capacities. "My mom said, 'You are going to flower camp.' I was horrified. I got there and was more horrified. When my mom came back to get me, I cried because I didn't want to leave." Amanda Cromer explains that she came to South Carolina from California for a summer family reunion. "My great aunt and my second cousin, Jennifer, both of whom I had only met once before, asked me if I wanted to attend camp with Jennifer who was a counselor there. They had already signed me up, and my flight back home to California was for a week and a half after the rest of my family's return. "As a first-year camper, I was older than the rest of the campers and as old as the CITs…Counselors-in-Training. It was hard to adjust to the accents and the heat. Not until Monday night when the entire camp lined up on the soccer field to sing Taps did I realize the opportunity I had here." Eventually, Cromer discovered that her attendance at camp and, later, graduation from Clemson were part of a secret plan set in motion by her grandfather. She is now a South Carolina public school teacher and the assistant camp coordinator of Camp Wildwood. In 1969, Miller White became a fisheries instructor at Camp Wildwood, primarily because he was "the new guy" as a biologist with the SCDNR. His son Robbie attended while in his mother's womb. Robbie and his brothers, Carter and Scott, all became campers and later counselors. White continued teaching at camp for forty-one years, even after his retirement. "I loved it; it was a gift to me and as rewarding as anything I have ever done. I always came home tired, but pumped up and enthusiastic about young people," he said. 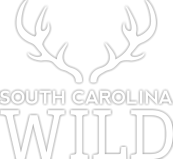 Camp Wildwood strives to promote the SCDNR's mission to promote natural resources conservation and instill a passion for the outdoors. Staff aspire to cultivate the whole camper. Once the adolescents step out of their comfort zones, they come out of their shells and discover their true selves. Campers build social relationships with peers. They are then encouraged to take an active role in the community and with conservation. Finally, the young folks are challenged to grow into leaders. "That is the triple threat," DuPre says. "As a camper, I was hit by all three," as evident in his achievement as student body president of Charleston Southern University. To ensure the triple-threat experience, participants are grouped into five niches of teenagers from different parts of the state. White explains: "In ecological terms, a niche describes how you fit in and what your function is." In their niche, campers attend daily classes. Wildlife covers biology and the terrestrial side. Hunter education provides an opportunity for hunter certification. Forestry addresses types of trees and instructs prescribed burning. Fisheries introduces campers to all sorts of aquatic life. "Hodgepodge" classes change daily and include boater education, archery, team building, herpetology and natural resources careers. For the past decade, Katie Black of Clemson University has been teaching Friday sessions: "Camp Wildwood has influenced countless students for Clemson's programs within the natural resources curriculums as well as created better citizens. 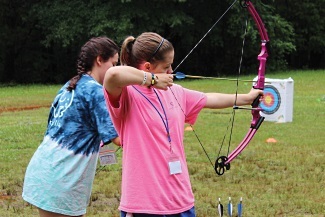 The fun camp atmosphere is contagious, and the influence is obvious, given the huge number of counselors and staff who come back year after year." The rigorous daily schedule begins with a 7:00 a.m. truck-horn reveille and again when it's time for "lights out" at 11 p.m. Evening activities consist of dances, games and other "surprises." "We keep campers hopping," DuPre says, "because a tired camper won't get into any mischief." Campers are required to accept all dance requests. DuPre explains this tradition: "We try to break down boundaries and create an air of acceptance." 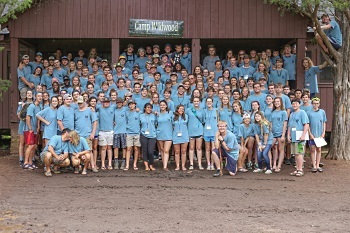 Besides the setting and tried-and-true schedule, the people make Camp Wildwood such a unique experience. "The campers have all been recommended; they are good, quality kids to begin with," White clarifies. The staff and counselors do it because they love it!" BeBe Harrison boasts. "Many counselors have donated their salary checks back to the camp." This is an amazingly selfless gesture, considering that counselors' compensation "pretty much just covers their gas money to and from camp." Counselors are members of an exclusive lot. Campers who exhibit the proper variety of enthusiasm, passion and leadership qualities are invited to return as second-year participants. This group is culled for third-year participants, who are further whittled down to CITs, or Counselors-in-Training. Finally, limited counselor positions are awarded to a chosen few. "What makes Camp Wildwood so successful is the high-quality staff," reflects White. "Dan and the counselors are just so effective. I would have adopted any of them. "We want a segment of the population to have an increased awareness and concern for the environment," says White. Harrison adds, "The garden clubs and Wildlife Federation hope to pique the interest of students so we have nature in the future, and so we have future leaders. As campers, we were taught to 'leave it cleaner than we found it.' When I returned from camp, I dropped a gum wrapper on the ground, and it gave me chills. I picked it up along with three more pieces of trash. My dad and I went fishing soon after, and when he threw a cigar wrapper in the river, I burst into tears. He has not littered since." Boyd Brown of Winnsboro was sent to Camp Wildwood by the Anemone Garden Club. He went on to be a counselor and a representative in the South Carolina Legislature. "We say Camp Wildwood is more than a summer camp - it's a family. It provided a great network of friends: from Kingstree and Charleston to Anderson and Rock Hill. Many of my closest friends today I met at camp." Brown continues, "The education a camper receives is second only to the friendships made there. Those weeks were some of the best of my life - even better than being in Chicago for the World Series!" White describes teaching a young Dan DuPre: "I remember that little red-headed kid in his first year. He did this thing where he would smash a soda can on his head and everybody would laugh." DuPre has become the poster child for Camp Wildwood. 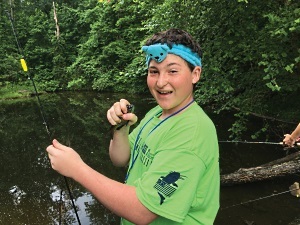 As a thirteen-year-old camper, Dan realized his life dream "to work in education with DNR." Harrison, who considers DuPre her little brother, also heard a career calling while at Camp Wildwood. She too pursued a career in education with the SCDNR, where she served for ten years. Harrison and DuPre camped together as youngsters, and "can finish each other's sentences." Eventually, Harrison founded Angling Women and teaches fishing skills to children and adults. She emphasizes the valuable mentors of Camp Wildwood: Miller White, Robert Gooding, Tina Frye, Charlie Mayer, Brian Bonds and many others. Bonds, a land surveyor who was camp director for several years, named his son in honor of Charlie Mayer, the director when he and Harrison were campers. Captain Bradley Taylor is a fishing guide who helps out as camp director. Cody Bishop of Cordova "fell in love with Camp Wildwood on the first day when I jumped in the lake for the swimming test." He has returned as a counselor for the last ten years, taking time off from the Clemson University Cooperative Extension Service in Orangeburg. "Camp Wildwood truly is a life-changing experience!" Boyd Brown proclaims. "If the reader has a child, niece or nephew old enough to go, it will be the best week of their summer!" Retired SCDNR biologist and longtime wildlife instructor Robert Gooding of Greenwood eloquently encapsulates the values of the clean, but grimy, Camp Wildwood adventure: "Don't never get nothin' on you you can't wash off!" Of course, none of it would be possible without the leadership of DuPre, the once-shy camper from Walterboro who found his niche at Kings Mountain so many years ago. In promoting Camp Wildwood, he visits more than twenty garden clubs each year. As special events coordinator for the SCDNR's Office of Media and Outreach, DuPre is also the director of the Palmetto Sportsmen's Classic. For his tireless efforts and passion, he recently was named the 2016 SCDNR Employee of the Year. Ford Walpole lives and writes on John's Island. As a Commissioner for the Charleston Soil & Water Conservation District and an English teacher at James Island Charter High School, he actively recruits campers for Camp Wildwood.